At first I thought I heard it wrong. So I looked up from my computer to pay attention and really listen. No, I wasn’t wrong. The Kmart commercial boasted of steep savings during its Martin Luther King Jr. sale. Eeww. Really? A Martin Luther King Jr. sale? Something about it made me shudder, kind of made me feel icky. But it’s a feeling I’ve felt before when I’ve seen tasteless party fliers with half-naked black women’s shiny breasts, thighs and backsides exposed next to a bottle of luxury liquor advertising Martin Luther King Jr. “unity” parties at nightclubs. The commodification of the King holiday feels disrespectful and wrong, especially because he advocated for economic equality and financial empowerment. 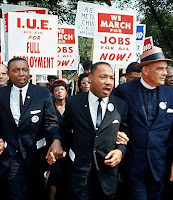 In the midst of high black unemployment, a flat economy and a global movement to distribute wealth it is time to revisit King’s advocacy for economic justice including a living wage and affordable housing – needs that remain elusive for many Americans today. On today, what would have been his 83rd birthday, the sight of Martin Luther King Jr. Day sales and party fliers make me sad and even a little angry that his image has been hijacked this way. This is America where capitalism and profit reign supreme. So I guess I shouldn’t be surprised. However, the reduction of King’s legacy to a weekend sale is too much. At the King Memorial dedication last October many of the speakers at the National Mall connected King’s concern for the poor to today’s Occupy Wall Street movement and his Poor People’s Campaign which called for Congress to help people of all ethnic backgrounds climb out of poverty. 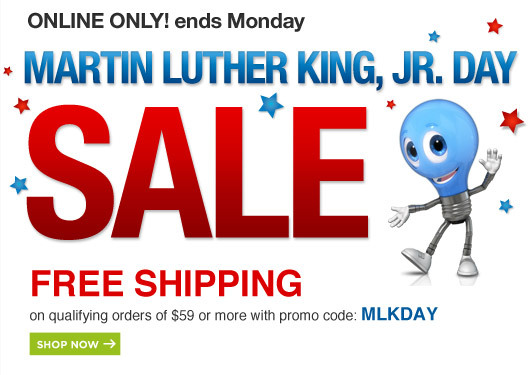 I don’t know how King would feel about a Martin Luther King Jr. sale. But I know I don’t like it or the shake-what-ya-mama-gave-ya nightclub posters bearing his image and name. So I won’t be sipping on Martin martinis at a bar or catching any King holiday deals at department stores this year or any King Day in the future. I respect him and his legacy too much for that.